After all the time spent watching movies, killing boredom was it worth it? Absolutely yes! Because you didn’t just kill time but gained new experiences and of course some movie knowledge which is simply amazing! Now here’s something for every single movie maniac on this page. We are going to ask you some questions from some of the most popular movies of all times from both Bollywood and Hollywood and all you need to do is, comment the correct answer. Sounds easy, right? Here’s the best part, all the correct answers are eligible for a lucky draw and there will be 1 lucky winner each day and a weekly winner. Contest happens every Friday and the winners will be announced on the following week. 1. 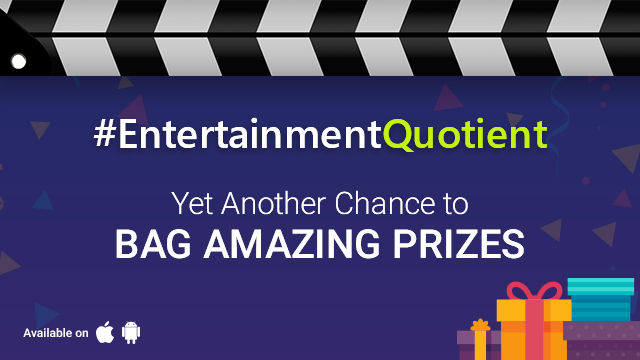 #EntertainmentQuotient contest is open to the registered users of VuLiv Media Player on Android and iOS. 2. Contest is not open to Friends and Relatives of employees of VuLiv (MSPL). Like the Facebook page of VuLiv Media Player, be the first to comment the right answer. 4. The winners will be announced on the following week on VuLiv Media Player Facebook page/community. I was in one of the weekly winner when will i get prize?